Russia, 1946, the Nazis recently defeated. Stalin gathers half a dozen of the top Soviet science fiction authors in a dacha in the countryside somewhere. Convinced that the defeat of America is only a few years away, and equally convinced that the Soviet Union needs a massive external threat to hold it together, to give it purpose and direction, he tells the writers: 'I want you to concoct a story about aliens poised to invade earth ... I want it to be massively detailed, and completely believable. If you need props and evidence to back it up, then we can create them. But when America is defeated, your story must be so convincing that the whole population of Soviet Russia believes in it--the population of the whole world!' The little group of writers gets down to the task and spends months working on it. I have to admit from the start that I am more familiar with the short fiction works of Adam Roberts and because many of his short stories were on my liking I was thinking for a while to start reading his longer fiction. This occasion arouse with his latest published novel, “Yellow Blue Tibia”. 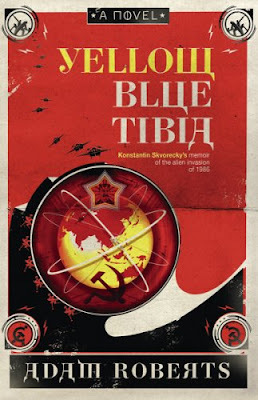 I was very young when the Communism fell in my country, but I have my childhood memories and the stories of my parents regarding that period, so the first thing that struck me while I read Adam Roberts’ “Yellow Blue Tibia” is how realistic is described the Communism times of that period. Well, there are small differences with what happened in my country, but the general line is quite the same. Adam Roberts builds an atmosphere close to reality and often throughout the reading “Yellow Blue Tibia” feels like a historical fiction or an alternative history. Although the novel has strong Science Fiction elements and a Sci-Fi plot and it would seem that these are lost in the story they are lingering in the background until the second half of the novel when they’ll come forth in full. I also absolutely loved the humor of “Yellow Blue Tibia”. Throughout the novel Adam Roberts creates amusing scenes, each one brightening my day and ripping a burst of laugh from me. Besides the amusing scenes there are dialogues that are delicious to read and savor and I find the dialogues between the main character, Konstantin Andreiovich Skvorecki, and the taxi driver Saltykov to be the cherry on the cake. There is also one particular scene, the queue scene at the end of the novel, which is sad in its realism, but so funny when I come to think of the situation. And it is true that in that Communism period if two people were standing in line a queue was formed almost immediately. Another thing that struck me hard at the “Yellow Blue Tibia” is its title. While I read I ask myself of the relationship between the titles and the novels and I also wonder of authors’ choices of titles. While I read “Yellow Blue Tibia” I was confused most of the time of the title provenience, until Adam Roberts cleared that thing up in one of the novel’s scenes. At that moment I closed the book and took another look at the title of the novel, the final realization giving me more pleasure in the reading of the “Yellow Blue Tibia”. The novel of Adam Roberts is garnished with action scenes, a steady and quick pace, very good humor and a unique love story, but above all “Yellow Blue Tibia” is one novel I wished it didn’t end. Your good review confirmed my wish to read this book. I read also other reviews of Yellow Blue Tibia for example Yellow Blue Tibia review by Adam Whitehead but nobody has your background. I mean your experience with communism. I will read the book in 2010 because paperback will be released in March 2010 and I buy paperbacks because of space problems. I think that my background worked a little in favor of the book, but I believe that anyone can enjoy it no matter the background. And I am mostly certain that a paperback edition exists already (I saw it on Gollancz and Amazon UK websites). Your review, Mihai, covered all the aspects of this book that sets out the story within. I am putting it on a Christmas list for a friend who likes these types of books.